Join the discussion on our forums! Come discuss Zentimo over in our dedicated Zentimo discussion topic. It's good. It's really, really good. The Hex value is just too good to pass. does golden Zentimo evolve other minions into golden if I user not golden Unstable Evolution on non golden minions? So much potential here! Loving the new Spell Shaman theme. It's not a "One Turn Kill" if you're using minions that were on the board from a previous turn or turns. And also deals 3 damage to either side of the two adjacent minions! Ancestral Spirit My Ancestors Watch over me! Lesser Sapphire Spellstone, perhaps good, but board space becomes issue. I don't think it works that way when you play an Overload spell. I might be wrong about this, but I think the way it's worded means that the spell isn't copied, it actually is a trigger effect. For example, if I was to play Crackle on Turn Five, the spell would trigger once, but it's EFFECT triggers once or twice based on board position. In other words, Crackle does at least 4 damage to the initial target and then at least 4 damage to minions on the initial target's left/right. Only one Mana Crystal would be Overloaded. The wording is such to separate it from something like Electra Stormsurge, which copies spells twice - and we know that any Overload spell Overloads double the Mana Crystals. Here, since the card doesn't copy spells, only the normal amount of Mana Crystals is Overloaded. I dunno, a mid-range token or aggro deck with 3 minions left on the board could 9 mana combo well with Zentimo + Rockbiter Weapon x2 + Windfury for an instant +36 damage combo (plus damage on the board x2). If you don't have two Rockbiter Weapon you could 10 mana combo the same thing with Zentimo + Electra Stormsurge + Rockbiter Weapon + Windfury. Windfury will probably be pivotal in OTK strategies with Zentimo. Indeed, but in my mind it was somewhat unrealistic... to have all those things coming together. You could also pull off insane Moorabi combos with Frost Shock. I don't think it will overload you for every minion 'hit' by any of these spells. It says 'also targets adjacent ones', not 'cast a copy of it at adjacent minions'. OMG, Evolve is back... with echo! Unstable Evolution only. Evolve doesn't target nothing, just affects the board. 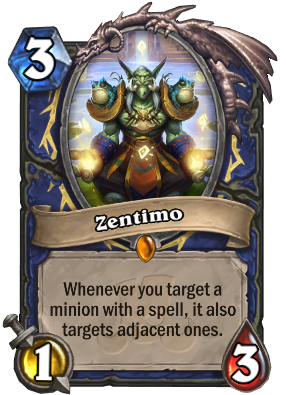 I think I would play Zentimo with any of those Spells you say aren't so good. Avalanche is like funky defile. Cryostasis could buff your board by +9/+9 for 2 mana, and if u hit some totems, they wont stay frozen for the extra turn. Tidal Surge is deal & heal for 12. With 3 minions on the board, the Spellstone makes copies of each minion. Windfury is a no-freakin brainer in any kind of more aggro/token deck (if Zentimo was even, that deck would be so damn broken haha). I really do believe this card is so strong, that it might be imperative to run like a zola or brewmaster or even the new Shaman minion Bog Slosher to use his effects multiple times.